Here's a look at our new baby! I went to a specialist this week for my ultrasound because of everything that's happened and also because I was born with a cleft palate. 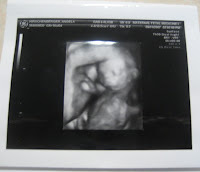 We had a 4-d ultrasound done, which is really cool and shows an actually form of the baby and not so alien like. Jon and I decided to find out what this baby was...one: so we could talk to Ty about a brother or a sister and two: I think we've had enough surprises for awhile. Don't get me wrong, I still think it's more fun to wait and see when that day comes and they put them on your belly to find out. But anyways...Ty is going to have a Baby Brother! He is so excited and so are we. They showed us the "pee-pee" and everything. It was pretty clear. Well we go back in 7 weeks for another ultrasound to keep a close eye on everything and I'm sure we'll have more phots then. Until then...keep us and our family in your prayers!